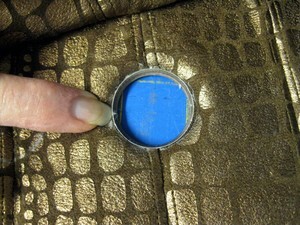 You will have some kind of template to mark the hole for the size grommet you have purchased. On my particular directions is says to mark around the template and then cut OUTSIDE the line. I am not telling you to NOT follow the manufacturer’s directions but my personal preference is to have the hole in the fabric a bit snugger. I like to cut INSIDE the line. My favorite tool is the Olfa Rotary Point Cutter using almost a stabbing motion to make sure the upper layers and the lower layers are cut the same – NO SURPRISES ON THE BOTTOM LAYERS! When I’ve done a pretty good job of chopping around the circle it is almost like it’s perforated. 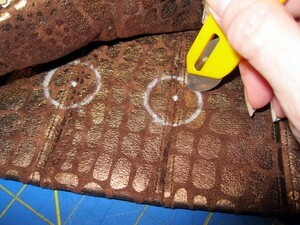 I then use a sharp scissors to finish the cutting of the circle. Next I stretch the fabric hole over the shank of the bottom part of the grommet and use my fingernail to ease it over the lip of the grommet. 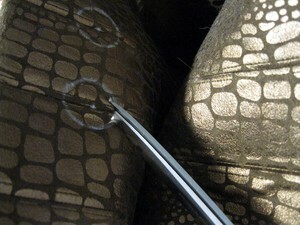 This is where I find a smaller hole to work better to grab on to the shank and sink down away from the top edge. I continue to run my fingernail around the outside edge of the shank to flatten the layers down – REALLY flatten them down and make sure there are NO STRAY THREADS hanging over the top of the shank. 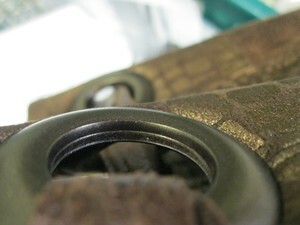 Now position the top of the grommet and carefully line it up to match the bottom. My directions say to use the palm of your hand to press them together – I like to use the flat part of a small rotary ruler. I can see through it to make sure the top stays level and it’s strong enough to press the entire grommet with equal pressure at the same time. Push until you hear a pop, then press some more to insure the entire inside is engaged. Sometimes they pop all at once and sometimes I get 2 or 3 pops as they go together. 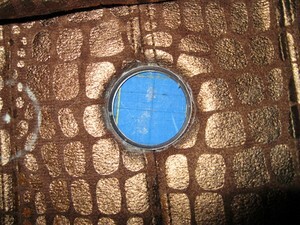 Then I look very carefully at the inside of the grommet to make sure the seam line where the two pieces meet is level all the way around, indicating that the grommet front and back are engaged and secure all the way around.